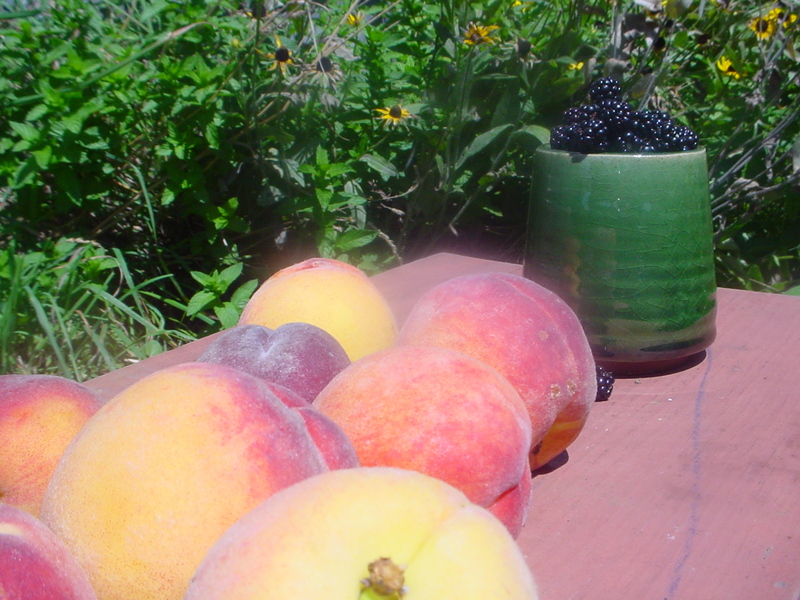 A few weeks ago, I bought a bushel of peaches. They are kinda rare around here these days, grown mainly tucked up against the North Mountain where they can enjoy some protection and extra heat. Luckily for me, this means a slight detour from my usual route to town and I’m driving right by the peach orchards. I took the box of peaches to the restaurant, where we ate as many as we wanted before adding them to mixed green salads, pasta dishes and whatever else we could think of. A wonderful discovery was the combination of peaches and kale with chicken and pasta. To try that, follow the directions for Pasta with Greens and Raspberries and substitute two diced peaches for the berries. I used to peel peaches for baking, but I’m done with that. Aside from the very tedious boiling for ten seconds, cooling, and slipping off the skins, peeling peaches removes a lot of the flavour and beautiful colour from the skin. Just wash them, and cut them up. Done. 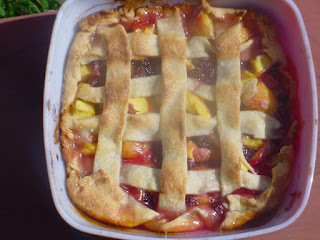 I found a lovely recipe for peach cobbler in a book titled “Cooking from the Heart”. 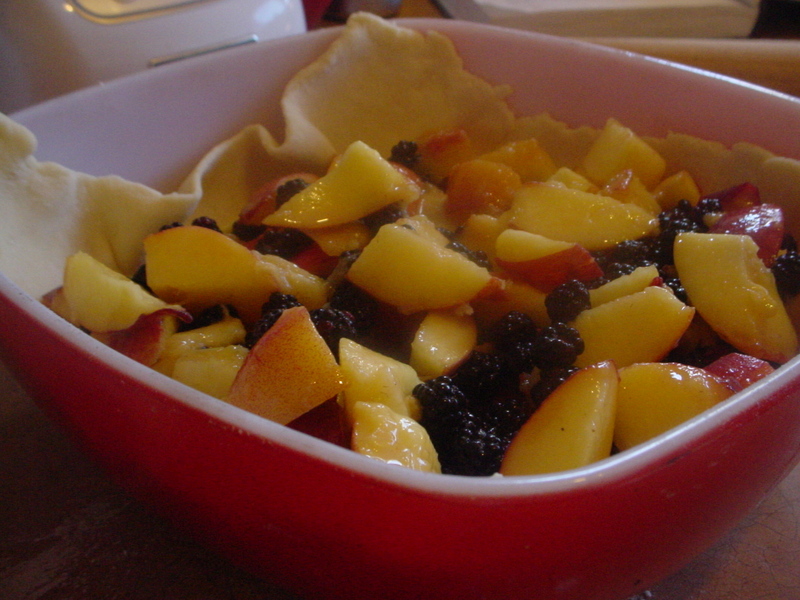 I messed with the pastry a bit, and since it’s also blackberry time, I added a few handfuls. A spoonful of whipped cream and it’s end-of-summer bliss. Preheat oven to 400°. To make the pastry, place the flour, baking powder, salt, and butter in the bowl of a food processor. Pulse until crumbly, about 12 times. Whisk the sour cream and apple cider vinegar together along with 1 tablespoon of water. Drizzle this over the flour mixture in the processor, then pulse another 12 or so times, until the dough forms clumps. Turn it out onto a piece of plastic wrap, gather up the dough, and fold the plastic over the top. Flatten into a rough square shape and refrigerate while you make the filling. Combine the peaches, blackberries, sugar, cornstarch, lemon juice and salt in a large bowl. Cut off 2/3 of the dough and roll it into a square roughly 10×10 inches. Fit the dough into an 8 inch baking dish, letting the dough hang over the edge of the dish. Pile in the filling, then cut up the 1 tablespoon butter and scatter it over the filling. Roll the remaining dough out ¼ inch thick and cut into squares or other shapes. Place these evenly over the filling, tucking some crust pieces into the filling here and there. Brush with milk or cream and sprinkle with sugar. Bake for 15 minutes, then reduce the temperature to 350° and bake for another 40 minutes, until filling is bubbling thickly and pastry has browned.